Can it maintain strong economic growth? India has the world's fastest growing economy, a status experts believe will continue for at least the next three years and possibly longer. 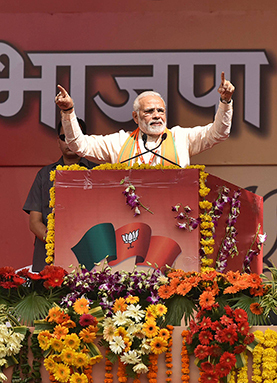 Since taking power in 2014, Prime Minister Narendra Modi has overhauled the country's tax structure, modernized bankruptcy laws and cracked down on corruption. With globalization, India's economy has produced more than 100 billionaires, and the middle class has expanded significantly. But major challenges confront Modi as he seeks another five-year term next year: The sprawling nation of 1.3 billion people remains riven by differences in income, education, religion, language and caste. Income disparity is rising, and one in five Indians lives in extreme poverty. In foreign affairs, India-Pakistan relations remain tense, and India worries that China, its economically and militarily stronger neighbor to the north, is undermining New Delhi's influence in South Asia. How India performs economically in the future will help determine not only the fate of its impoverished masses but also the country's place as a regional and global power.